ECONOMY TEMPORARILY TAKING A BACK SEAT TO SECURITY AND CULTURE? [Ottawa – February 20, 2015] The only thing hot about frigid Canada right now is the dead heat capturing the political landscape. There are some movements, but they are more of the twitch variety than structural movements. At the fringes, the electorate seems to be lurching around like a drunken monkey, but the new normal of a deadlocked Conservative/Liberal race seems to be a stable undercurrent. 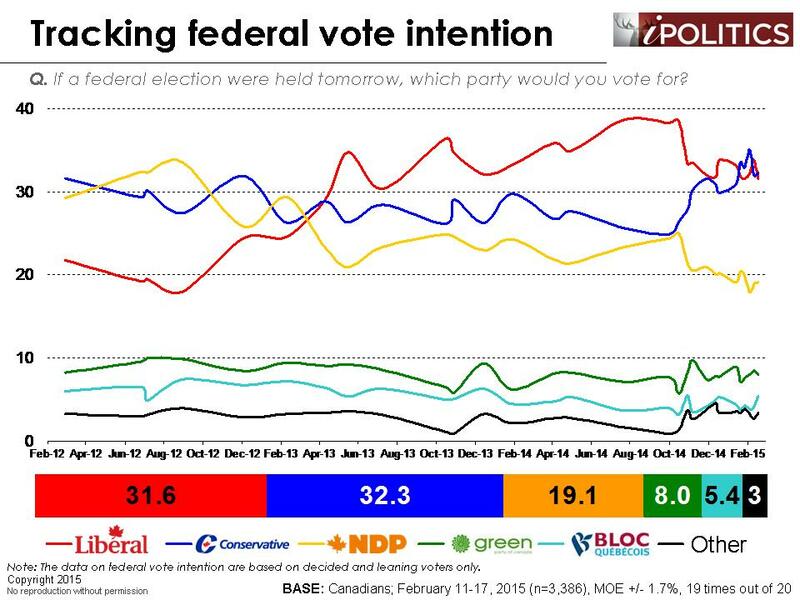 The Conservatives and Liberals are in a statistical tie at thirty two points each, with the NDP trailing at 18. A surprisingly and probably overstated Bloc Québécois is part of a remarkable four-way tie in the ever-interesting Quebec political arena. The dead heat theme continues in the other key arena of Ontario where a virtual tie exists and the same virtual tie is evident in Manitoba (but with a smaller sample base). 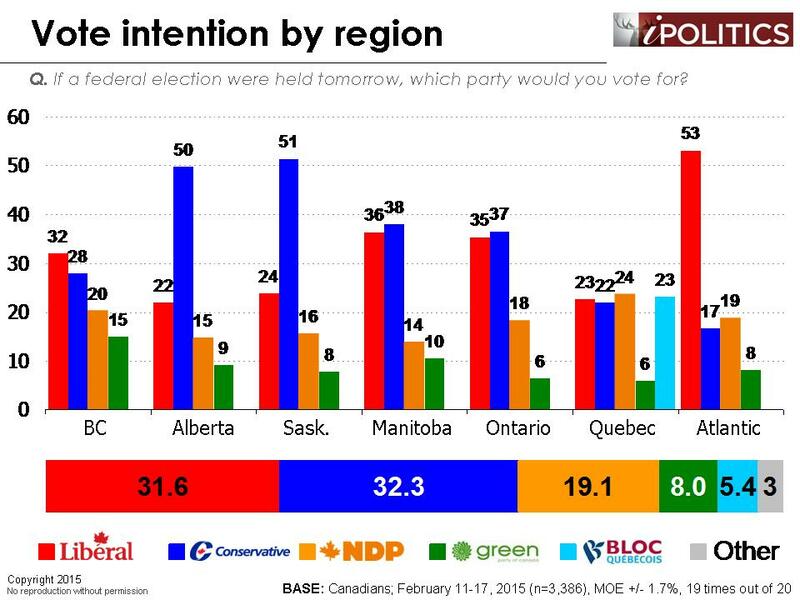 The Liberals own the East and the Conservatives own Saskatchewan and Alberta (although voter ardour for them has cooled somewhat as the economy has hit the skids). The perpetually confusing race in British Columbia shows a competitive four-way race with the Liberals on top. 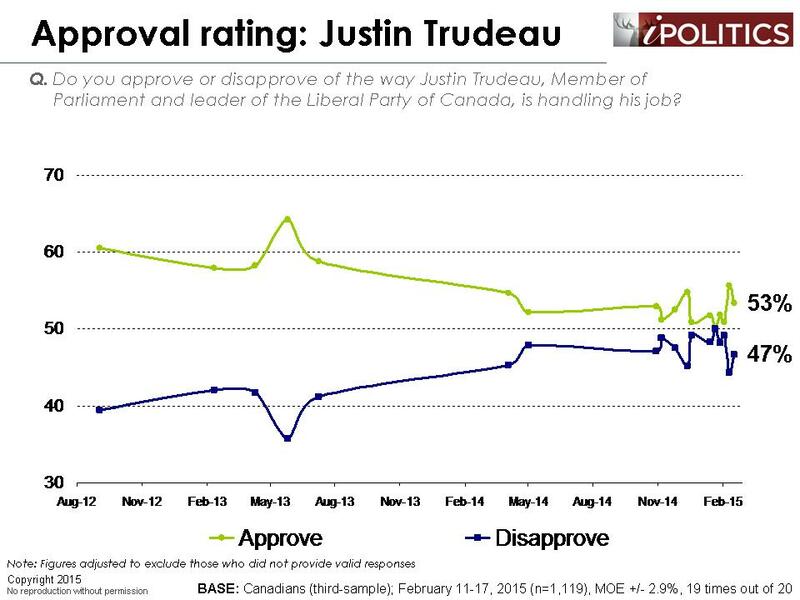 In our experience, British Columbian voters’ enthusiasm for the Liberals is always higher in the polls than it is at the ballot booth. 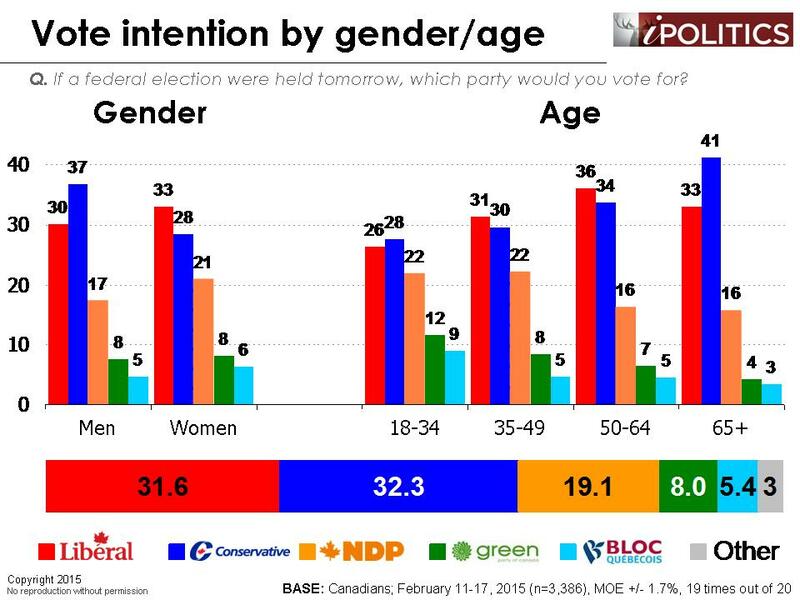 The demographic profile with respect to age, education, and gender is pretty familiar with the Conservatives in great shape with older, male, and less well educated Canada. 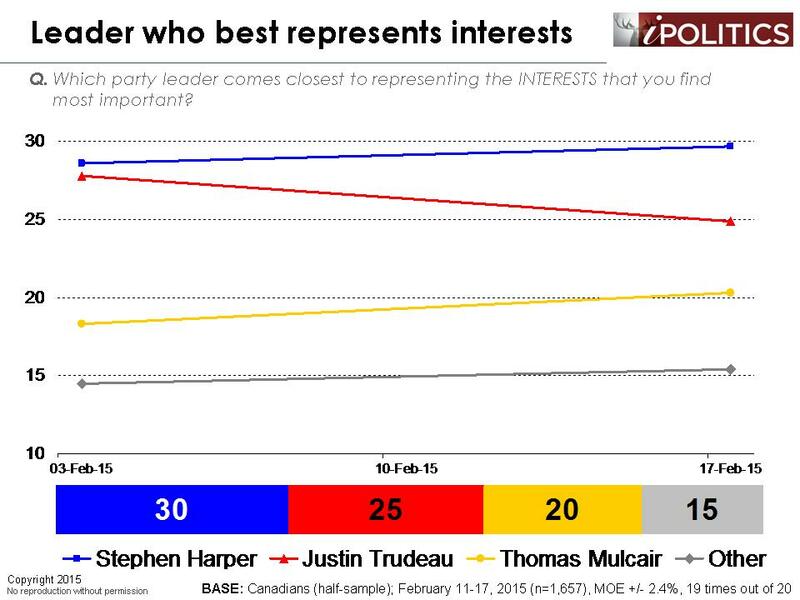 Perhaps the most interesting demographic pattern is the link to the New Canadian vote. Given the salience of the debate about ‘jihadists’ – and now the niqab – by the Prime Minister, it is interesting to note that these issues seem to be finding favour with the less educated and Harper is rekindling previously frosty relations with francophone voters in Quebec (particularly in Quebec city). 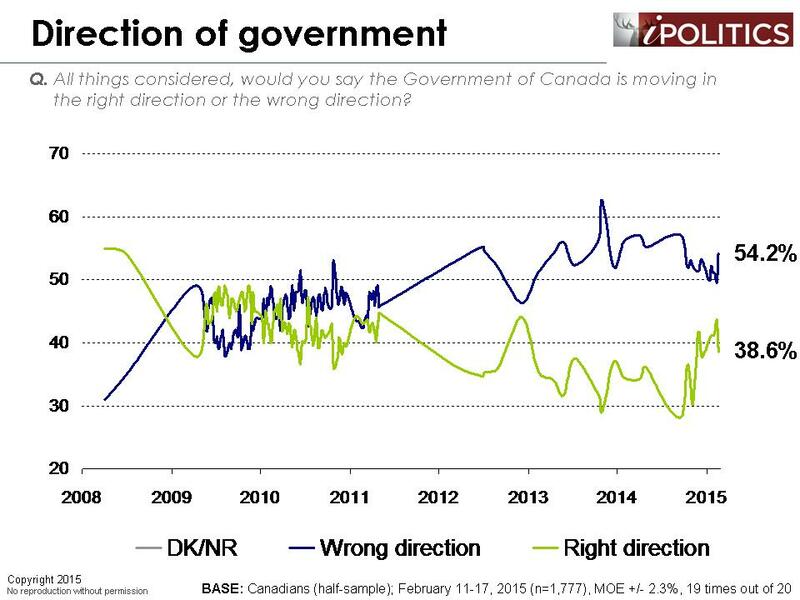 In a potentially interesting illustration of the tradeoffs in political arithmetic, it is curious to note that the Conservatives are now doing poorly with new Canadians, which is now one of the strongest segments of Liberal support. Bloc resuscitation: real or inflated? The Bloc Québécois has enjoyed a surprising comeback in recent weeks, although their support is still well below historical levels. This recent surge probably does not mean a lot, but it means something. The Bloc has no machinery, little money, and a leader who is not particularly popular outside of a small base of ardent sovereigntists. So why are they doing so much better? 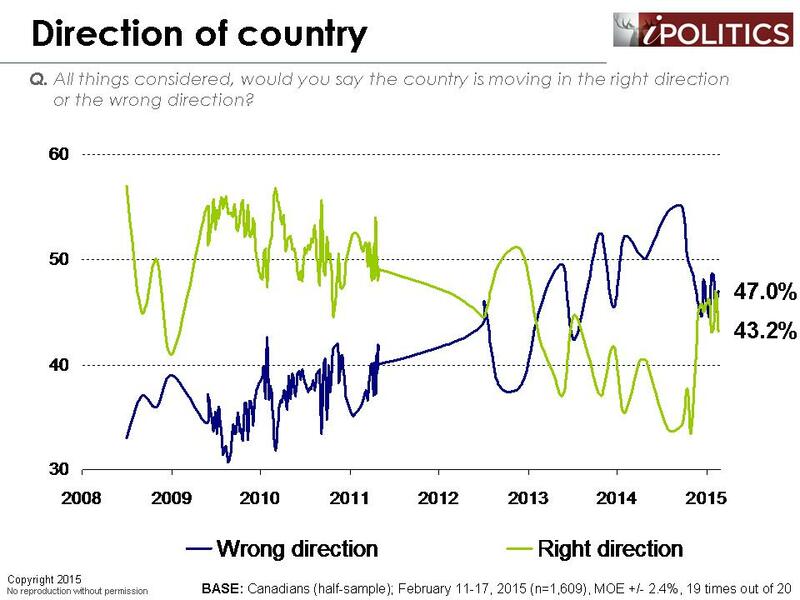 First, we need to recognize that the Quebec voter landscape is extremely volatile and very loosely rooted. The Bloc vote is an anti-federalist vote which is unhappy with the ruling Conservative Party, but is not particularly excited about the Liberals either. The party’s base is disproportionately young and poorly educated. 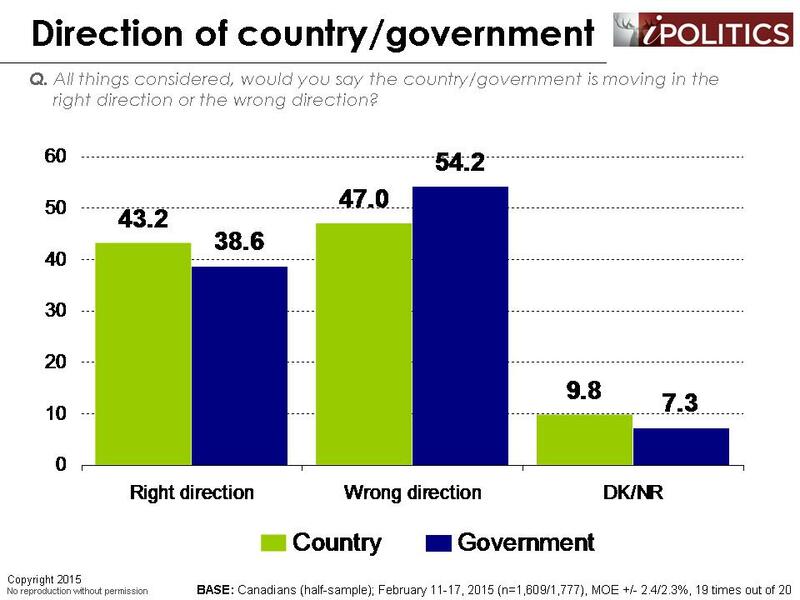 These voters are driven more by social issues that sovereignty, but they would have a hard time switching to either the Conservatives or the Liberals. 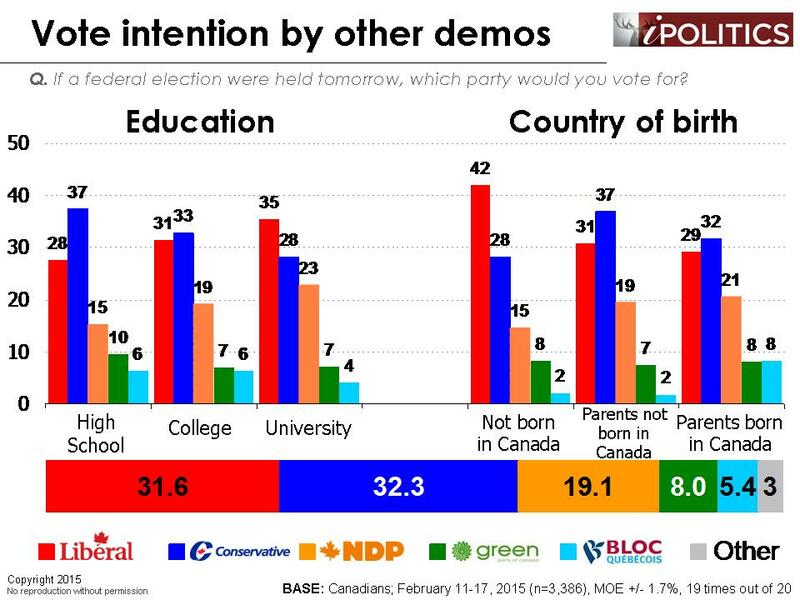 In all likelihood, a large portion of these voters will either stay home or default to the NDP come Election Day. From other research, we believe that values are going to be critical in this election. Values are critical to emotional engagement and, as we all know, emotions win elections. 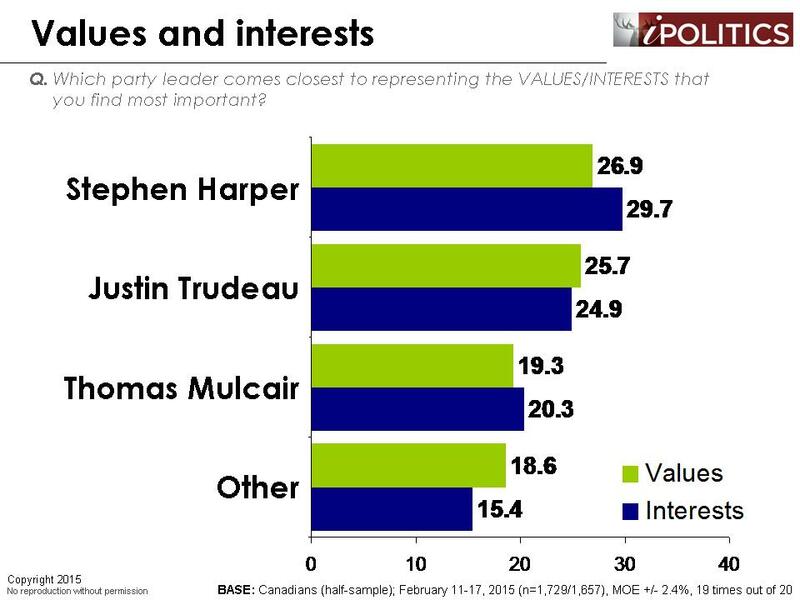 Last fall, it was clear that progressives had a clear advantage on values and there was an apparent frustration with the values narrative of the Harper government . However, this normative advantage (which is highly important because it drives turnout) seems to have been rather abruptly surrendered to the Conservative Party. To explain this shift, we do not have to look much further than the security file. As we have previously discussed at length , the shooting episode in Ottawa, followed by the horrific shootings in Paris and the serial barbarity of ISIS, have all coalesced to produce a very significant shift in public fears about security. More recently, Mr. Harper’s position the niqab seems to appeal to the same segments who were attracted to Quebec’s secular charter. These voters now seem to be drawn to the Conservatives with this combination of security and now the charter. We do recognize, however, that the Parti Québécois, the architects of the secular charter, faltered in the last provincial election. The kind of hyperbole extending to the jihadist threat, and referring to wearing a niqab at a citizenship ceremony as “offensive”, may be finding favour in certain places, but it is interesting that this has not enhanced Mr. Harper’s surprising values advantage from the last poll. While this strategy appears to resonate in some areas of Quebec (a surprising finding considering that Quebeckers have traditionally favoured civil liberties and human rights), it may be hurting the party’s standing with new Canadians. 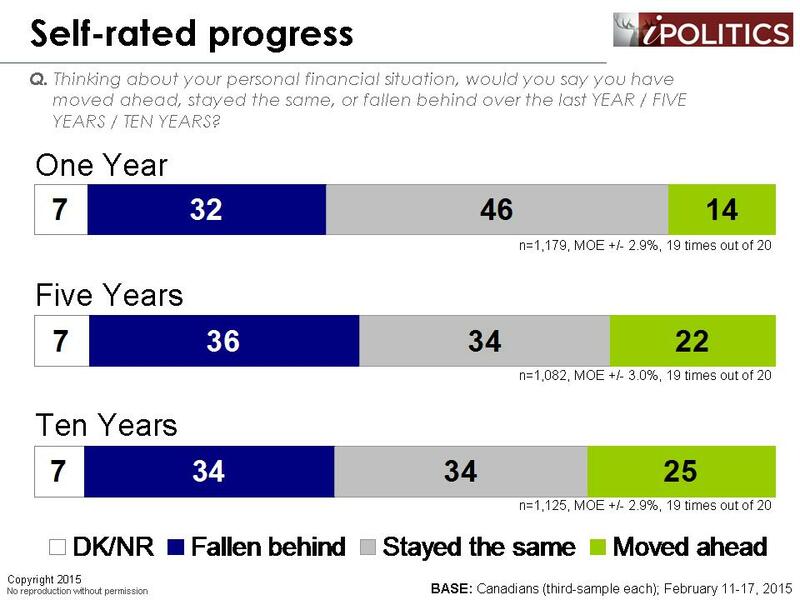 It is also surprising to see that the typical gap between Quebeckers – who have been historically less supportive of military engagement – and the rest of Canada is no longer evident with the current mission. Furthermore, other values could very quickly displace this effect. 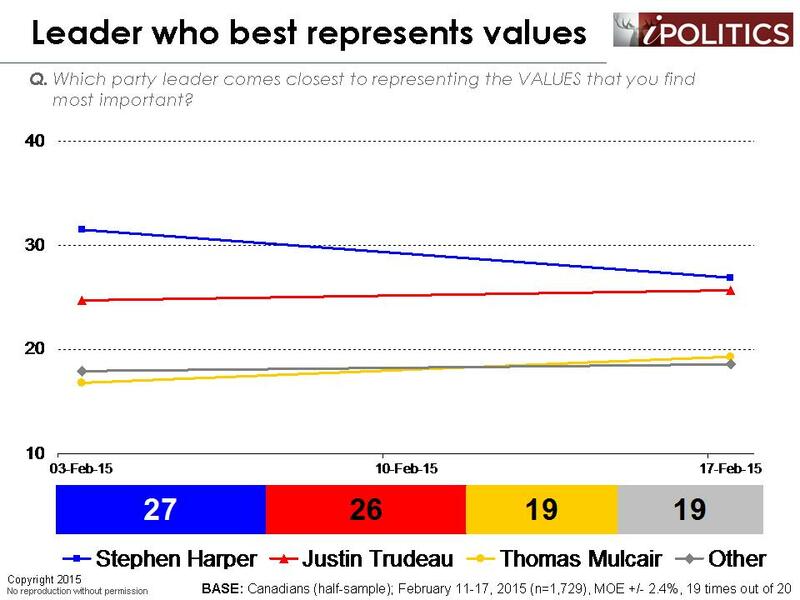 Indeed, the somewhat shocking values advantage that Harper had opened up two weeks ago already seems to be fading. In any case, the opposition leaders have yet to join this broader values contest, which will be critical to the outcome of the next election. Could progress (or the lack thereof) tilt the scales in the next election? Compared to the last time we asked it, the rather grim sense of arrested progress appears to be even more dismal that the last sounding. This issue bears following, because if it continues to be the case that only one Canadian in seven believes that they have done better than last year, progress will be a difficult ballot booth issue for the Conservatives to overcome in the fall when the emotions surrounding the terror file may have receded. The field dates for this survey are February 11-17, 2015. In total, a random sample of 3,386 Canadian adults aged 18 and over responded to the survey. The margin of error associated with the total sample is +/-1.7 percentage points, 19 times out of 20. 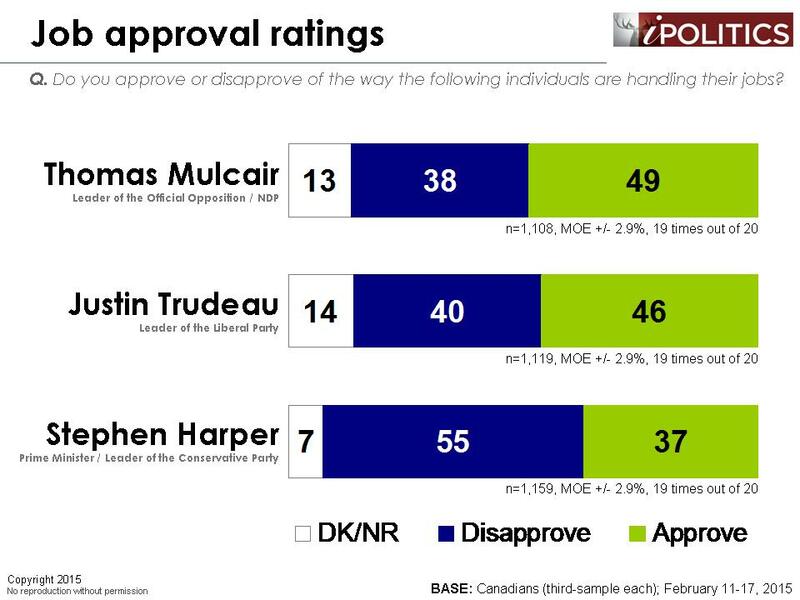 Why is Elizabeth May not included in the approval ratings or considerations of the party Leader who best represents your values? 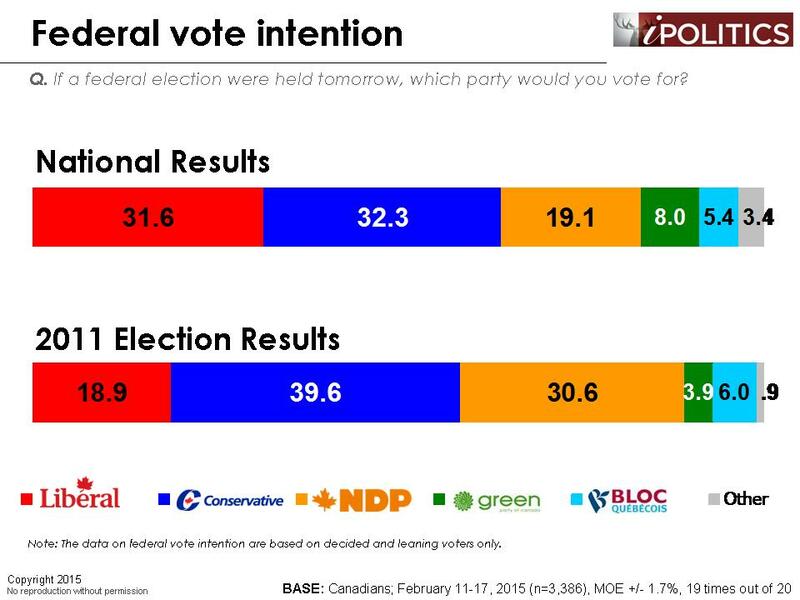 This seems odd, given that on the ballot box question the Greens are treated equally and that the province with the third most seats is, as you polls have consistently shown, a “competitive four-way race”. 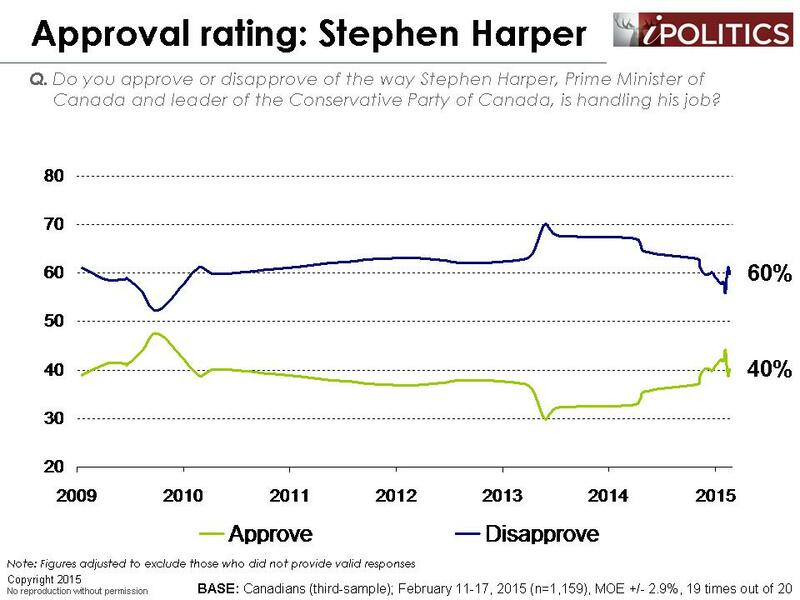 I think that PM Harper’s decision to move into Syria should hurt his possibilities of achieving a majority government.